EAST LANSING — No. 9 Michigan State dropped three spots in The Associated Press poll after losing two straight for the first time this season. “We’re going to try to get up off the mat,” coach Tom Izzo said Monday. 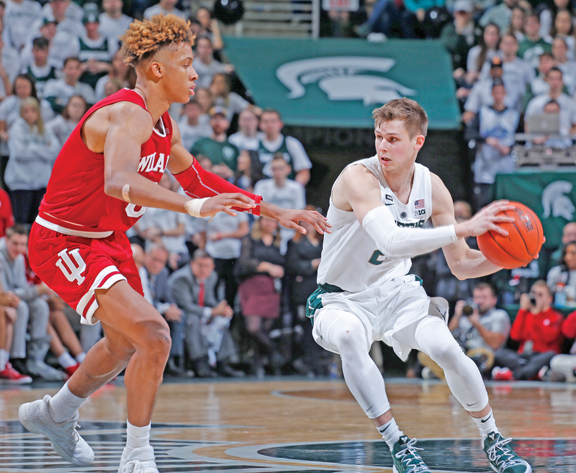 The Spartans got knocked around and beaten at home by previously slumping Indiana in overtime Saturday, nearly a week after losing by 10 points at Purdue. Michigan State (18-4, 9-2 Big Ten) is aiming to repeat as the Big Ten’s regular-season champion, but its losses last week took away a potential cushion. The Spartans have fallen into a three-way tie atop the Big Ten with No. 7 Michigan and No. 15 Purdue and the leaders have a slim lead over No. 19 Wisconsin and No. 24 Maryland. night at Illinois, which is tied for 12th in the Big Ten, and Saturday at home against middle-of-the-pack Minnesota. Izzo thinks the regular-season champion will have at least three or four losses by the time its first 20-game schedule closes in a month. To hang another banner at the Breslin Center, the Spartans desperately need Nick Ward to bounce back. Ward was 1 of 9 at the line, making one of two shots when MSU trailed Indiana by one with 18 seconds left in regulation. He wasn’t the only one who struggled at the line as his team was 8 of 22. It was uncharacteristic for Ward, who made all nine attempts at the line over the previous four games, and for the Spartans, who have made 72 percent of their free throws this season. While Izzo can forgive and forget Ward’s woes at the line, rebounding remains a concern. The junior forward had just two defensive rebounds against the Hoosiers and a total of just nine last week. Izzo lamented his team’s lack of physical play Saturday and didn’t back off that criticism two days later. Izzo is in the Basketball Hall of Fame and has won one national championship and eight Big Ten titles along with coaching in the Final Four seven times because his teams play tough defense, rebound tenaciously and hustle. Cassius Winston vowed the Spartans will get back to their scrappy ways. “We’ve got to make a promise to ourselves that we’re not going to get beat, we’re not going to get outworked,” said Winston, a finalist for the Bob Cousy Award that recognizes the nation’s top point guard.